With election fever running high, it is celebrities which are campaigning for major political parties. BJP, Congress and Aam Aadmi Party have declared popular stars as candidates for their parties this year. 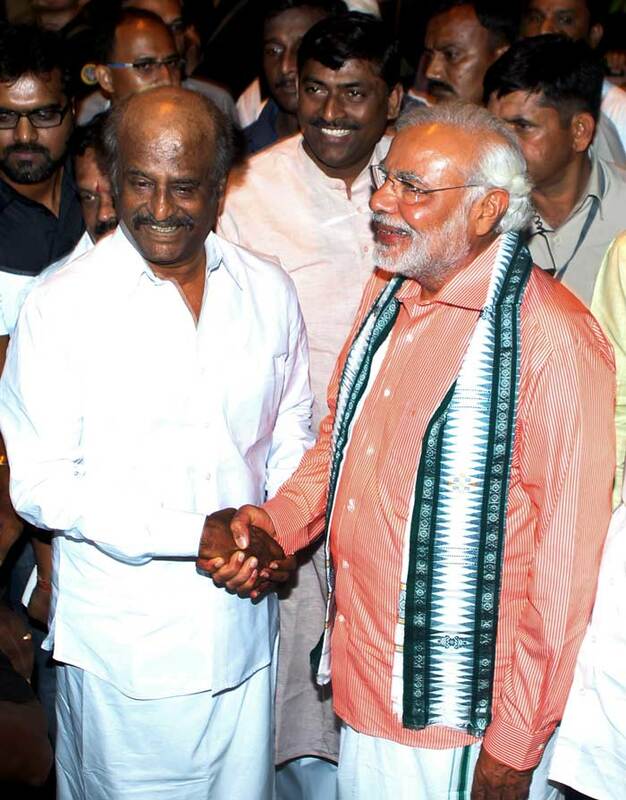 BJP's prime ministerial candidate Narendra Modi, clad in traditional south Indian dhoti attire, shakes hands with film actor and cultural icon Rajinikanth during a visit to the actor's residence. Modi was campaigning for ongoing parliamentary elections in Chennai. 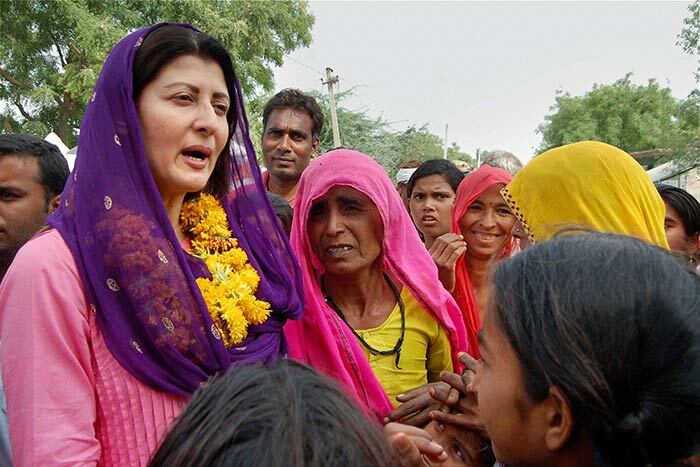 Sangeeta Bijlani campaigns in support of Congress candidate Mohammad Azharuddin in Tonk. 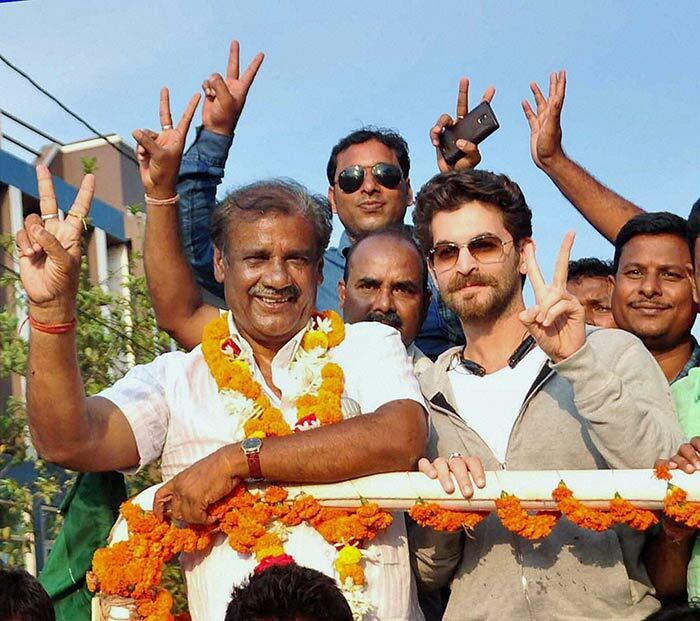 Bollywood actor Niel Nitin Mukesh campaigns for Biju Janata Dal candidate in Bhubaneswar. 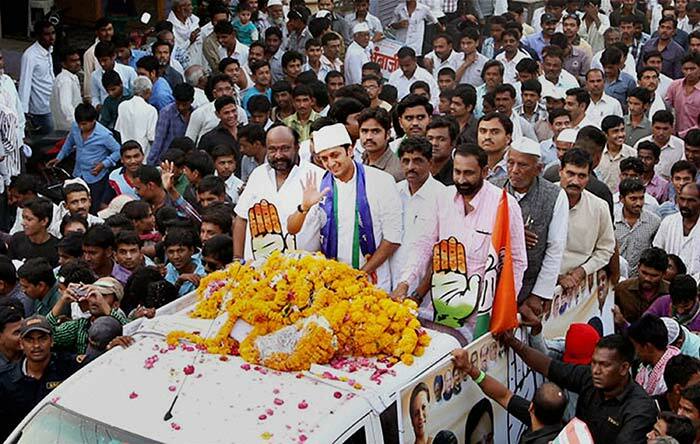 Bollywood actor Ritesh Deshmukh during a roadshow in support of Congress candidate in Latur, Maharashtra. 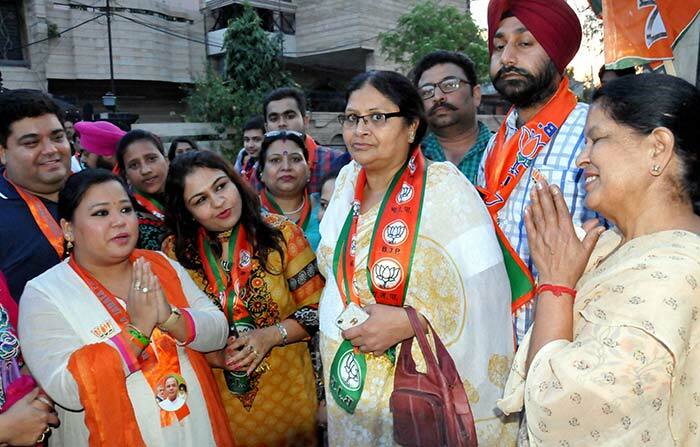 Stand-up comedian and actress Bharti Singh campaigns for BJP Lok Sabha candidate from Amritsar Arun Jaitely in Amritsar. Former cricketer and BJP leader Navjot Singh Sidhu during a roadshow in support of party President and candidate Rajnath Singh in Lucknow. Bollywood actor and member of parliament Mithun Chakraborty, Trinamool Congress (TMC) party candidate for Darjeeling constituency Baichung Bhutia, and West Bengal Chief Minister and TMC leader Mamata Banerjee gesture to a crowd during a rally in Siliguri. 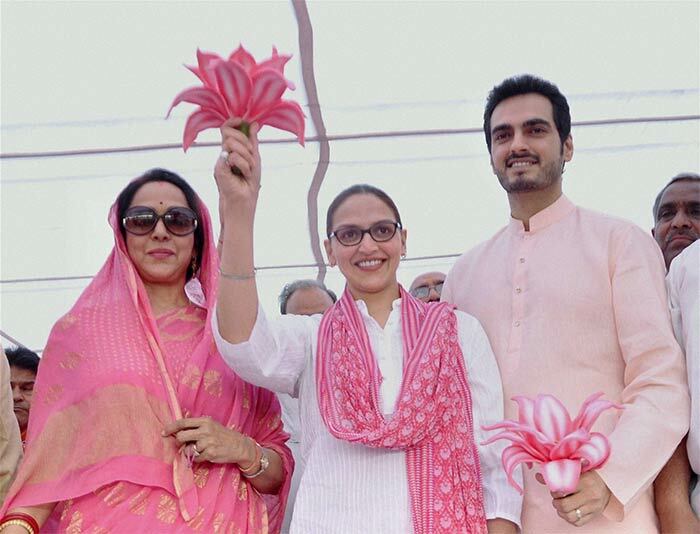 Bollywood actress Esha Deol along with husband Bharat campaigning in support of her mother and BJP candidate Hema Malini in Farah near Mathura. 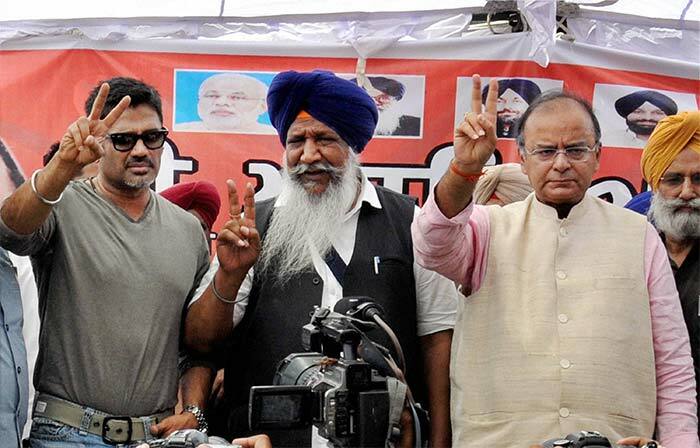 Bollywood actor, Sunil Shetty campaigns for BJP candidate from Amritsar - Arun Jaitely. 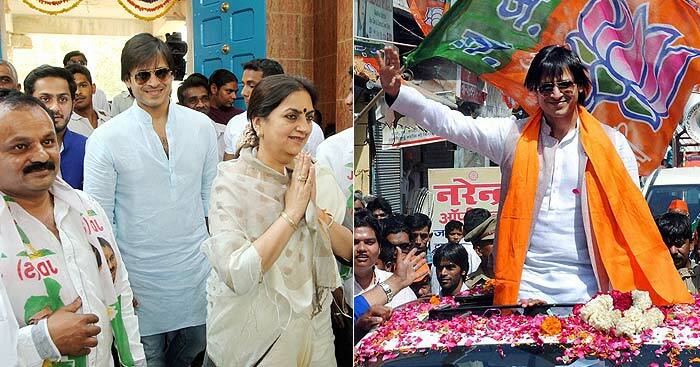 Bollywood actors Rati Agnihotri and Bhagyashree campaign for Congress candidate Sagar Meghe at Wardha in Maharashtra. Bollywood actress Sridevi along with husband-director Boney Kapoor campaign for RLD leader Amar Singh in Fatehpur Sikri. 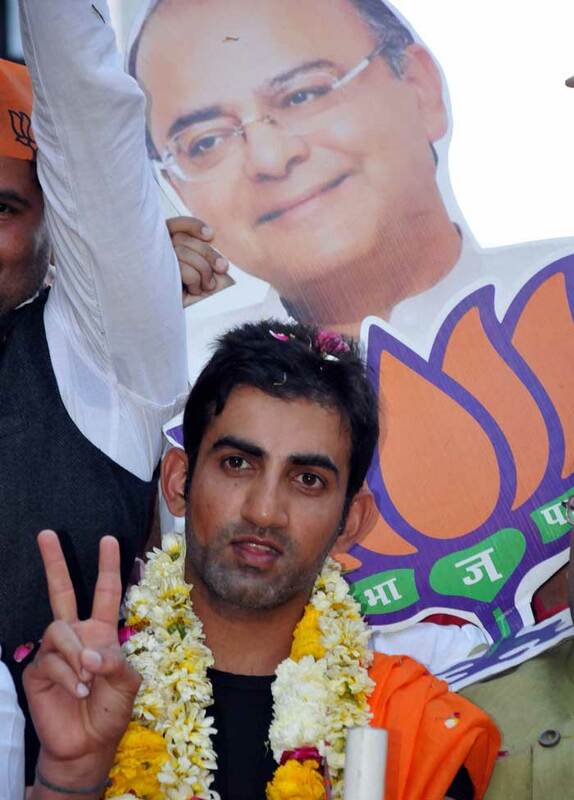 Cricketer Gautam Gambhir campaigns for BJP candidate Arun Jaitley in Amritsar. Actor Vivek Oberoi campaigned for his mother-in-law and JD(S) Bangalore Central candidate Nandini Alva in Bengaluru. He also participated in a road show in support of BJP candidate VK Singh. Actress Padmini Kolhapure campaigns for actor and TMC candidate Biswajit Chatterjee in New Delhi. 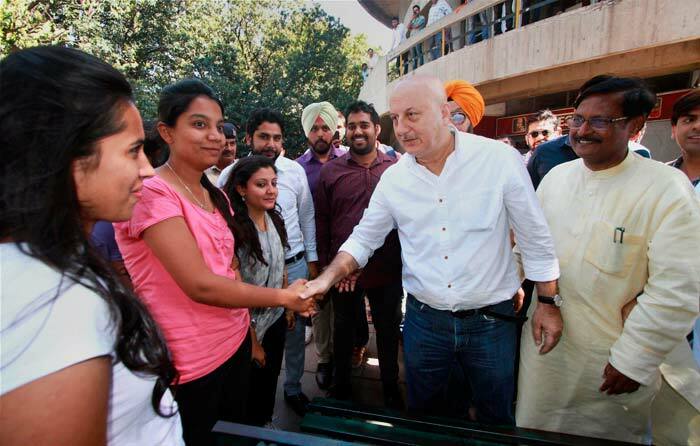 Bollywood actor Anupam Kher shakes hand with people as he campaigns for his wife BJP candidate Kirron Kher in Chandigarh. 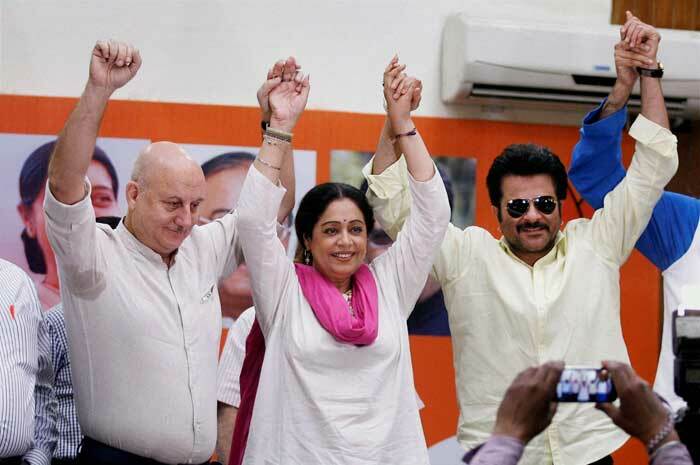 Bollywood actor Anil Kapoor joined Anupam Kher in campaigning for BJP candidate Kirron Kher in Chandigarh. 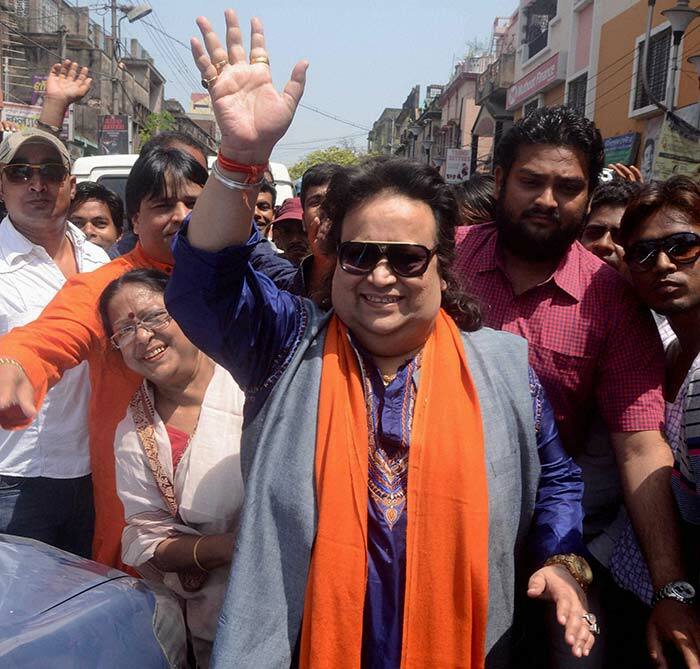 Music composer and singer Bappi Lahiri is BJP's candidate from Sreerampore in West Bengal. Actor-turned-politician Jaya Prada joined Rashtriya Lok Dal (RLD), scotching all speculation about her plans to make a beeline to the Congress. Seen here, RLD candidate Jaya Prada with party leader Amar Singh at an election rally in Bijnor. 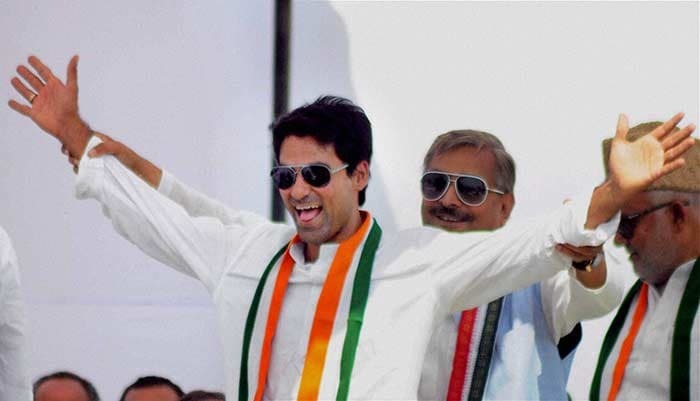 With the Lok Sabha elections fast-approaching, political parties have thrown in star campaigners as candidates. 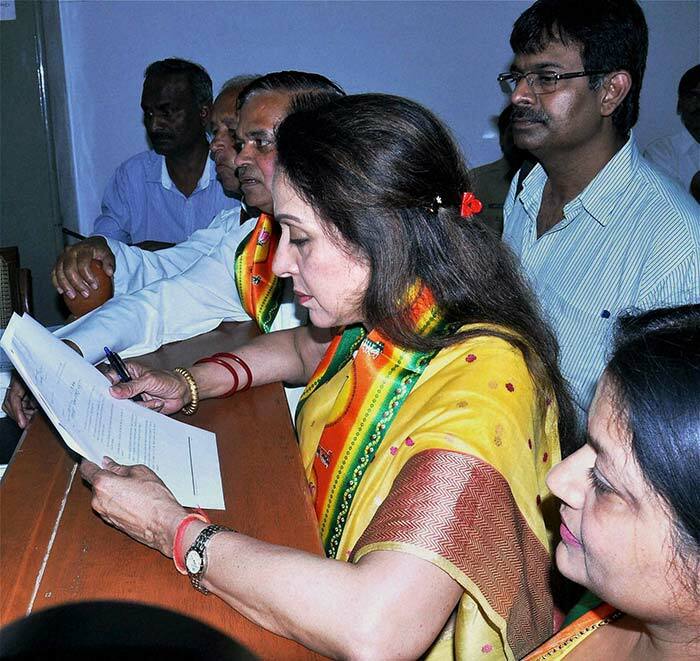 Bollywood actress and BJP candidate Hema Malini files her nomination papers for the upcoming Lok Sabha elections in Mathura. Bollywood actor Javed Jafferi has been fielded from Lucknow as AAP party's candidate to take on BJP President, Rajnath Singh. Former India football team captain Baichung Bhutia is the Trinamool Congress candidate for the Darjeeling constituency. 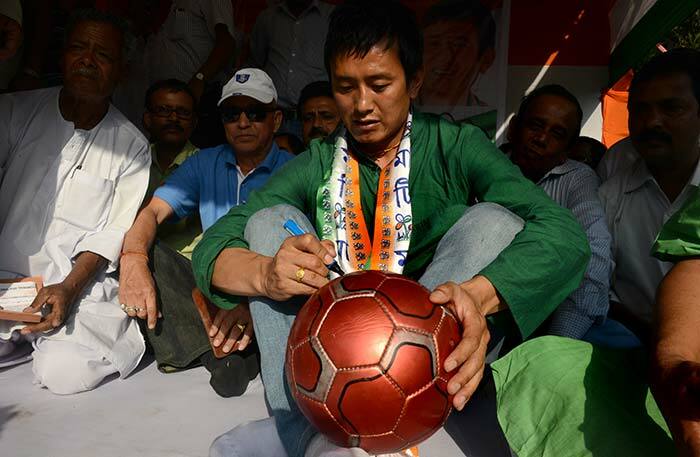 The sportstar signs a football during a rally at Chopra village, some 50 kms from Siliguri. Legendary actress Suchitra Sen's daughter Moon Moon Sen is TMC's candidate from Bankura district of West Bengal. She takes on nine-term CPM MP Basudev Acharya. 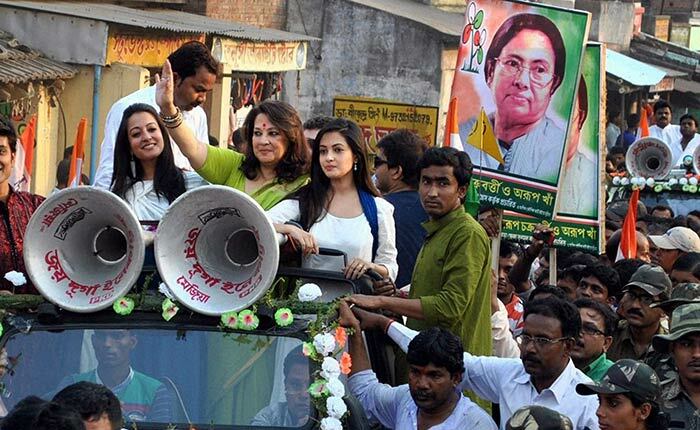 Seen here campaigning with her daughters Riya and Raima Sen during her election campaign in Bankura. Congress candidate from Phulpur Mohd Kaif, and senior party leader Pramod Tiwari during an election campaign rally in Pratapgarh. Aam Aadmi Party (AAP) candidate Gul Panag during her campaign for Lok sabha election in Chandigarh. 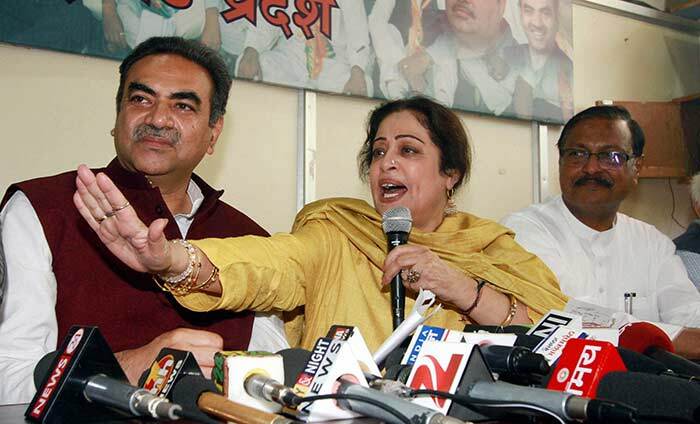 BJP candidate Kirron Kher with party leaders Sanjay Tandon and Satpal Jain addresses a press conference at the party office in Chandigarh. 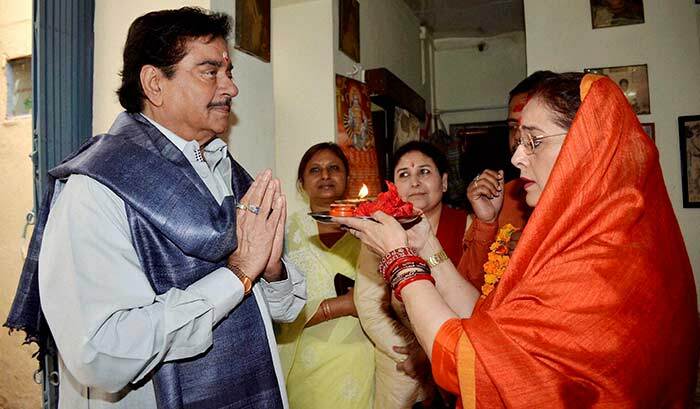 Poonam Sinha performs aarti of her husband Shatrughan Sinha, BJP candidate for Patna Sahib, before he filed his nomination papers in Patna. 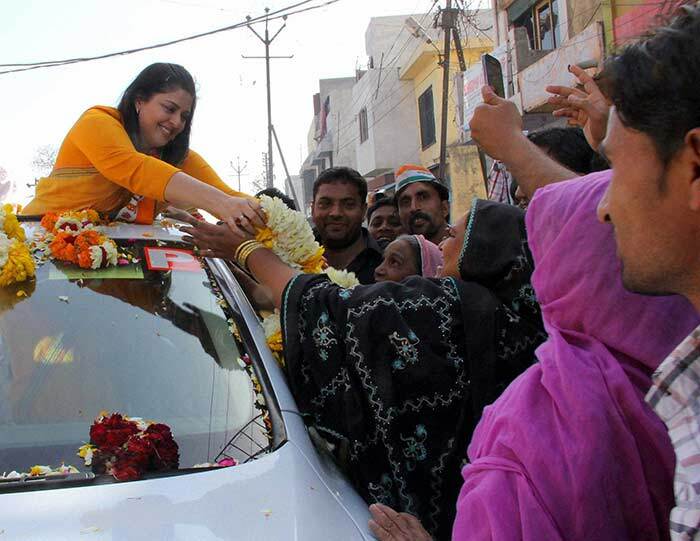 Congress candidate Nagma during her election road show in Meerut. 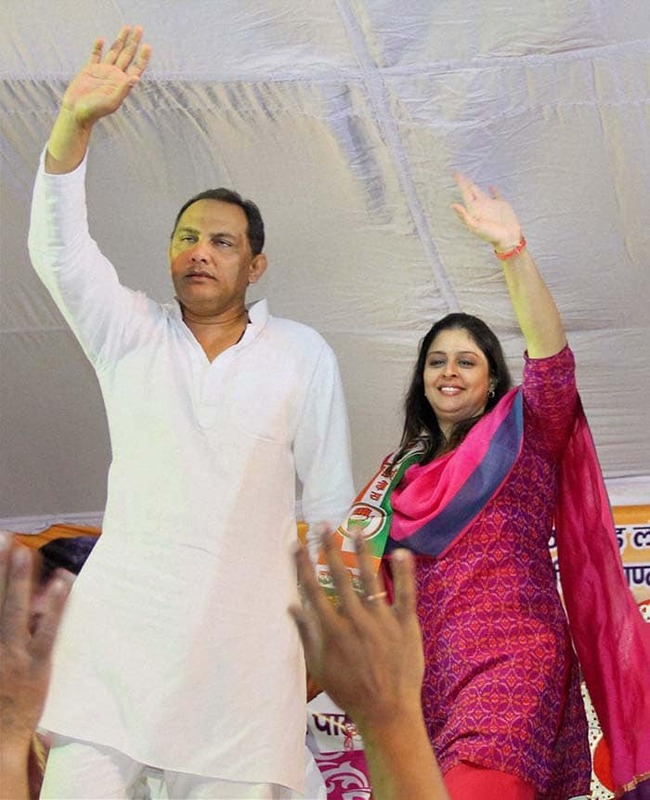 Congress leader Mohd Azharuddin and party candidate from Meerut, Nagma during an election meeting in Meerut. Bollywood actress Monika Bedi campaigning for Congress candidate Acharaya Pramod Krishnam during an election campaign in Sambhal. 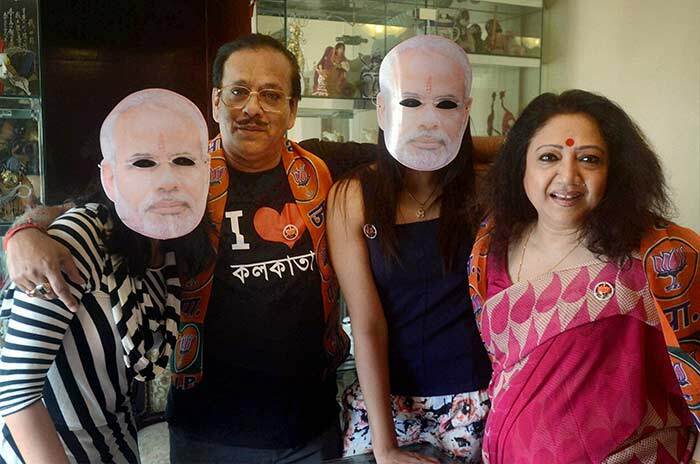 Magician and BJP candidate P C Sorcar and his wife Jayshree Sorcar along with daughters Moubani and Mumtaz, wearing Modis mask, in Kolkata. Actor Rakhi Sawant at a press conference in Mumbai. She will contest from the Mumbai North-West constituency. Actor and BJP candidate Paresh Rawal during an election campaign in Ahmedabad. The 63-year-old actor will contest from Ahmedabad East.